We are loving this late summer heat wave as it gives us hope that drinks on the patio and weekends at the cottage aren't yet a thing of the past. Our closets, though, are getting mixed messages. One week we are transitioning to warm weather "this is the end of summer" clothes, and the next we are pulling out our favourite tees and tanks all over again to soak up the summer sun while we can! Luckily for us, our pieces are made to be versatile and transitional, so we have options that stay at the front of our closets all year round. The trick is all in how you layer and what you choose to pair your wardrobe workhorses with! 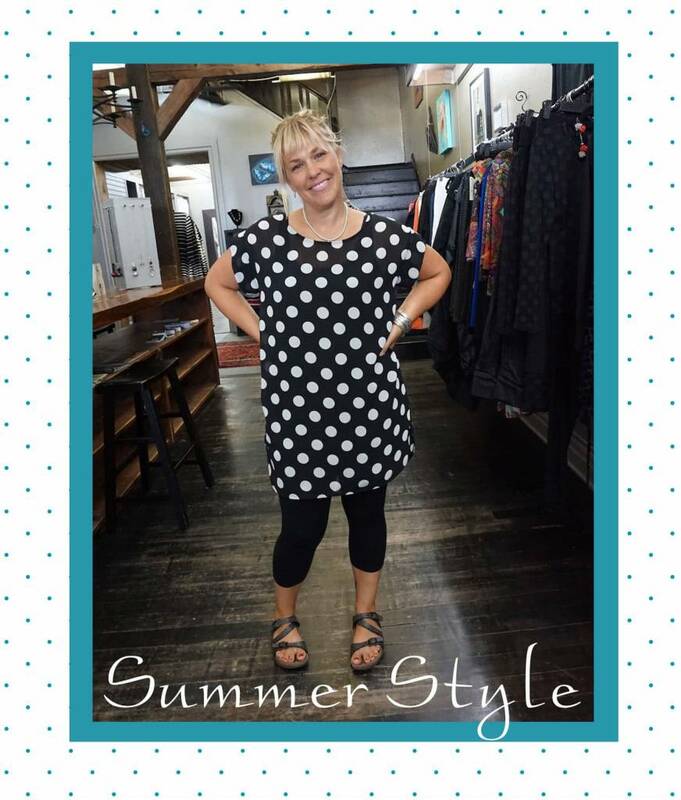 For this week's pick, Bean is tackling this very issue and showing us how one piece (the Dot Blouse) can be styled two different ways to take you through multiple seasons. This light summer look begins with the foundation piece, our Dot Blouse. Light and airy, this print is perfect over our Lousje & Bean 3/4 leggings for a fun casual look or can be worn on its own to double as a bathing suit cover up for beach days! A Long Black Bamboo Tank is worn underneath the blouse and performs magic tricks to smooth you in all the right places and accent your best assets. Loose and light, this pairing will take you all the way through our Indian summer, keeping you cool and chic. Dot Blouse worn over a Cora Underdress. This look is effortlessly transformed into a casual and cozy solution to take on the cooler fall and winter temperatures. Our Cora Underdress is a long sleeved version of our classic Tank Dress and functions as an amazing first layer to keep you warm while adding dimension and style to your look. Worn underneath the Dot Bouse, this dress gives you a long and lean silhouette and makes the Polka Dot pattern pop on the blouse. Bean has added a Rim Belt for a flattering, cinched in style and has topped the entire look off with a Ruby Necklace. Named after her own daughter, this line of Jewelry is most definitely one of Bean's favourite go-to pieces.